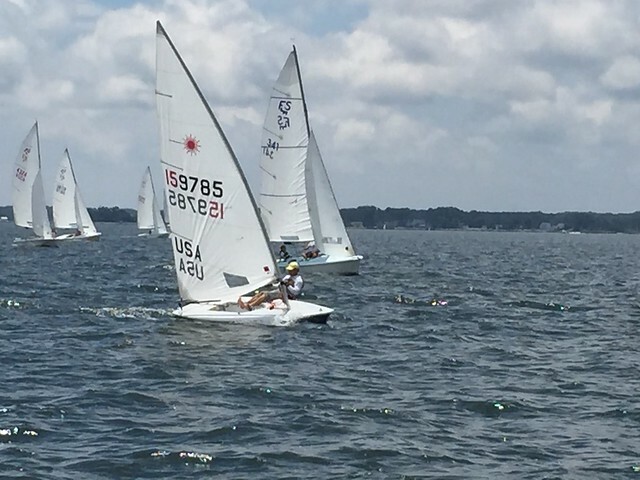 To complete the July 4th weekend the Lasers joined the Summer Seabreeze Regatta at FBYC and 7 of us had some quality racing in overcast and 7-10 knot breezes. 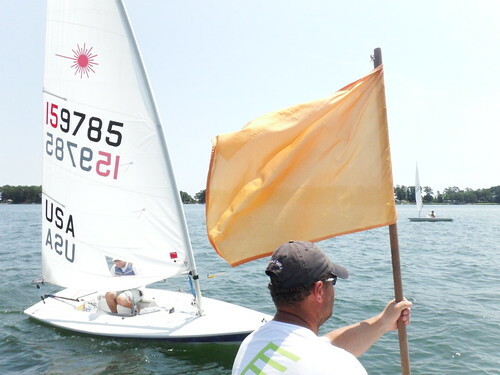 I focused on my starts and started well and had good speed upwind and downwind. Just couldn’t get ahead of Charlie Brewer and settled for 2nd in 2 races. 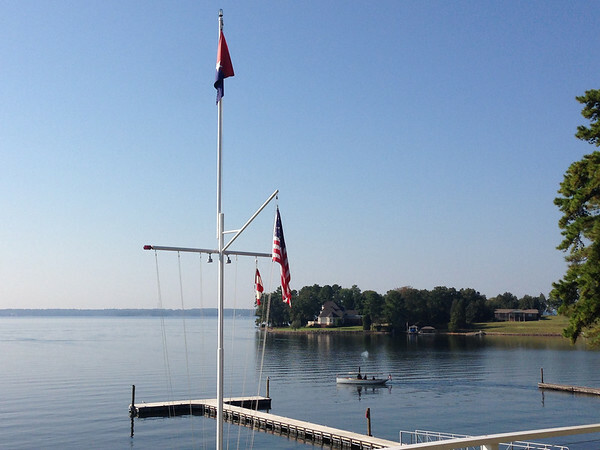 What a great day to end the sailing season on at Fishing Bay Yacht Club – temperatures that were not too cool and enough wind to make it interesting. 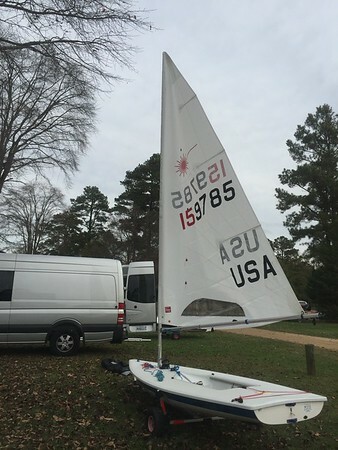 I just received the new MkII Laser Standard sail and was eager to try it out. 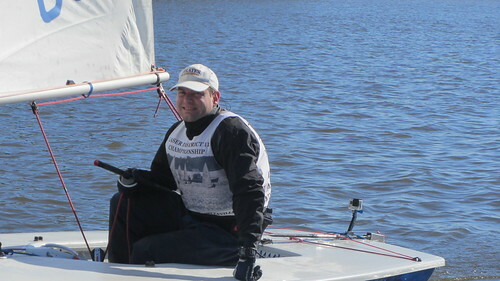 Having sailed a few races – it definitely felt a bit tweakier than the other sail – as in – it didn’t stretch as much, so you can really see where it needed adjusting, cunningham, vang etc. I had a little trouble figuring out when to adjust various things. All in all it probably wasn’t any faster or slower – but I was definitely slower with the distraction. I’m looking forward to spending a little more time figuring it out. Finished 2nd overall in 7 races. 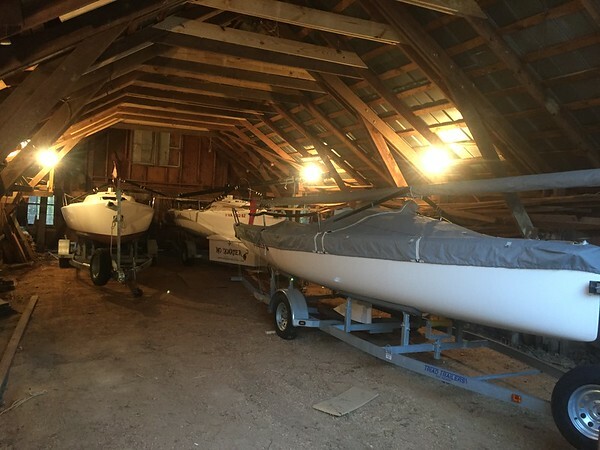 Following sailing I put a cover on the J/70 and helped Mike arrange 2 more boats in his barn. 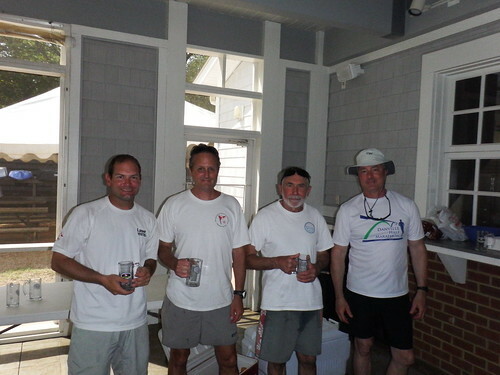 We had a beautiful day for racing in the July 4th Long Distance Race at Fishing Bay Yacht Club. 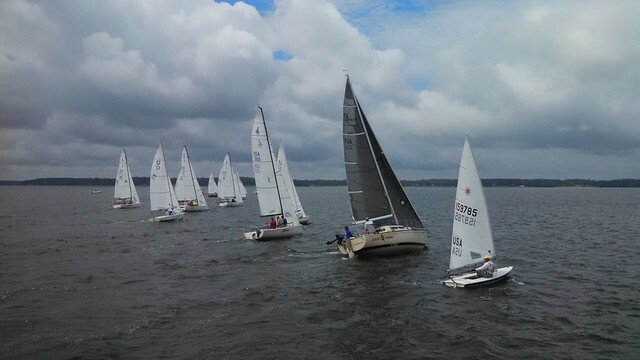 28 boats ranging from J/70 to S2 7.9 to Flying Scot to Front Runner to Laser to 420 were on the starting line for a Portsmouth Handicap race of about 8 miles. Being short of crew I took the Laser and did my best not to fall too far behind the fleet especially as one of the smaller boats. 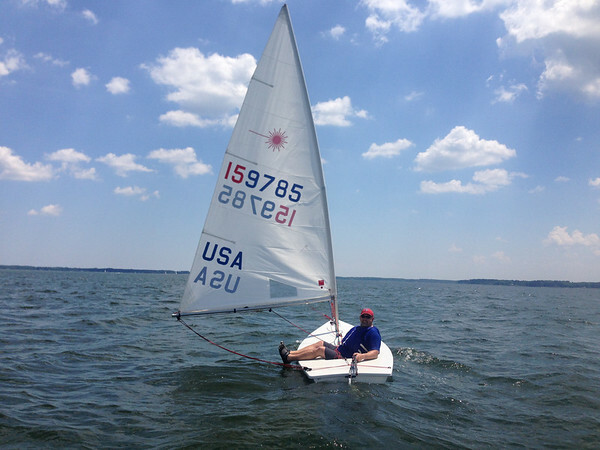 I could do pretty well on the upwind and downwind legs, but on the reaches – the boats with 2 sails and especially those with asymmetrical spinnakers would just walk away. In the end it was a respectable 13th – just above mid-table. Following racing there were over 200 people for a cookout followed by a little rain followed by fireworks well into the night. For the final day of the weekend I invited a few friends to come sail Lasers. Len loaned me his boat and we had mine and two others to take 4 people out. It was a beautiful day as the wind built and Bob, Lisa, Jenn and Mike all had a great time sailing around. Once they had their fill and the wind really settled in, Len and I went out and did some tuning by doing a couple laps on a 1.5 mi course. 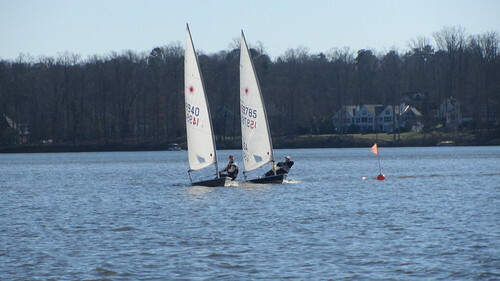 Today was a dual day of running Fishing Bay Yacht Club‘s Crew Training Program and trying to get some Laser racing in during the Laser Spring Regatta. 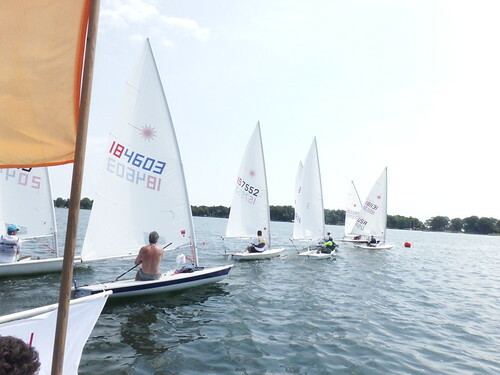 After meeting with the training class early in the morning and seeing them off for their training sails – I joined the Laser fleet for a race and a half before retiring to meet the training class on their return to shore. The wind today was a lot like yesterday with 8-10 out of the north. Just enough to be sitting out, but not so much to have to depower or spend a lot of time fully hiking in the puffs. The Lasers were started with the Front Runners and I was able to quickly pull away from the other Lasers. But that put me smack in the middle of the Front Runner fleet for the remaining 4 legs of the race. I had a fun time balancing between trying to beat the Front Runners, not getting between them and screwing up their race, and making sure I didn’t do something stupid and get caught by the Lasers behind me. In the end I was the first Laser across and finished just behind the 1st Front Runner. 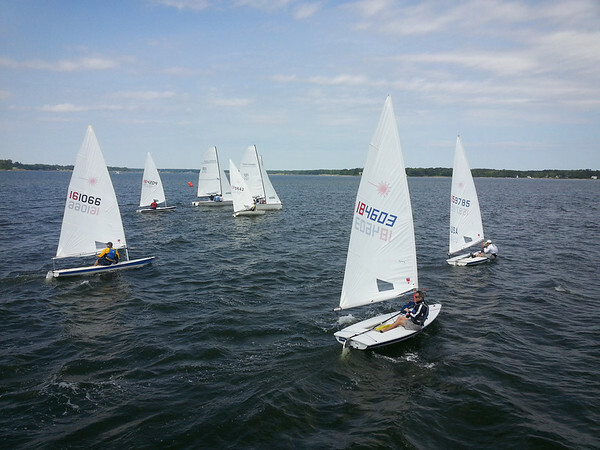 Even though I missed the next 3 races, it was fun to get out on the water and get to hang out with the crew trainees, the laser sailors and the other fleets. 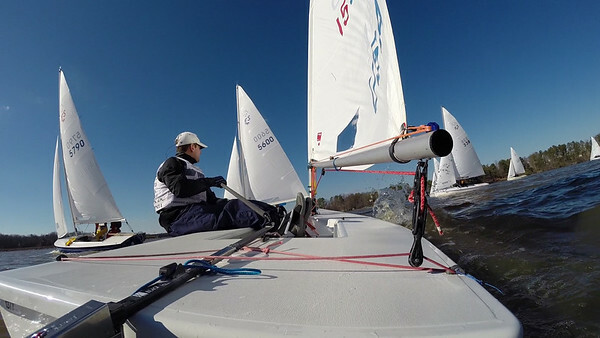 This weekend Greater Richmond Sailing Association invited Fishing Bay Yacht Club Flying Scots and Lasers to join them for frostbiting out on Swift Creek. Dan and I were the only two Lasers; there were 10 Flying Scots and 3 Thistles. The goal for the day was simply get back in the boat and try a few things out. I tried a new GoPro Camera (Hero 3+) and a new stern mount for it. I got to try out some new boots and I got to try sailing at a club I had never been at before. Thanks again to GRSA for inviting us to come sail! Photos courtesy of Sharon Wake. 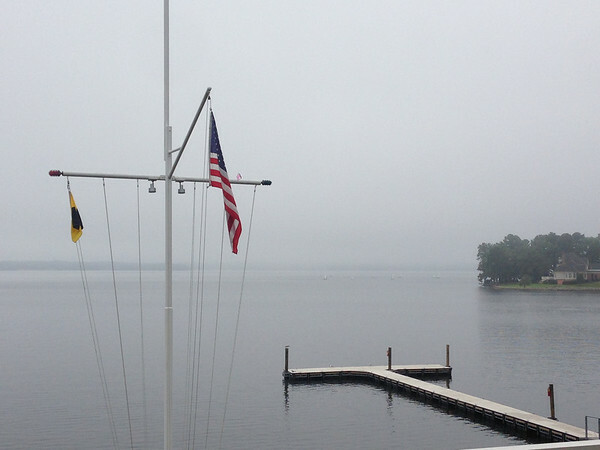 Woke up to a pretty thick fog this morning and little prospect of wind. The race committee had bumped up the start time to 9am for a first warning hoping to get a few more races in. Most of the fleet headed out into the thick fog and in the distance I could hear the horns of a race starting and later being abandoned. In the picture above you can barely make out the lasers just behind the point. 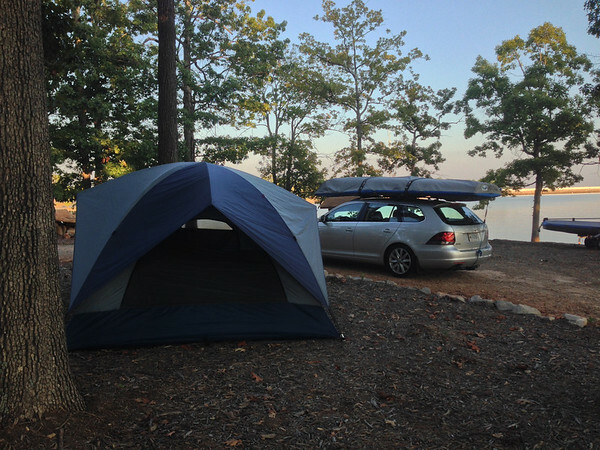 Rather than race in nearly no wind, I decided to get on the road and get home at a reasonable hour, so I packed and headed out. Turns out no races ended up being run at all and Saturday’s results stood. 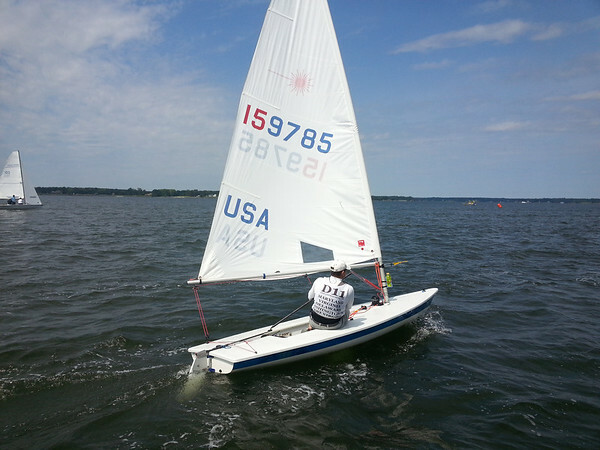 Despite the lack of wind, it was still a fun time and I got to meet a lot of cool D12 sailors. 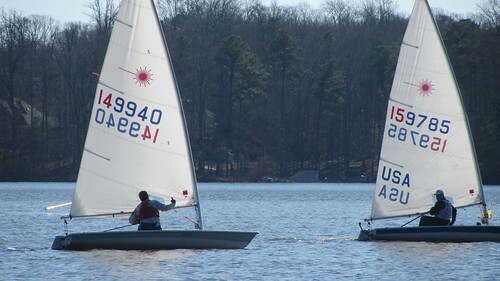 Thanks again to Columbia Sailing Club for having the Laser sailors back and putting on a great regatta! 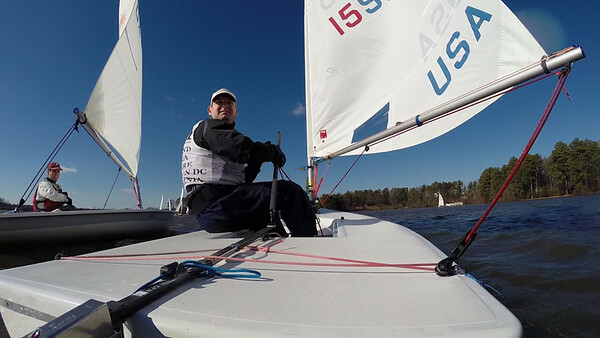 At the Columbia Sailing Club for the 1st day of the the District 12 Grand Prix and South Carolina State Championship regatta and we had lighter than light wind to start the day. We postponed ashore for about 2 hours before a wisp of wind appears and we headed out. We sailed around the corner from the club on the North side of the lake. This became important because those who sailed near shore got an incredible lift. Of course I didn’t learn that in the the first race and found myself out to the left on the first beat and deep in the fleet, settling for 11. It amazed me how fast the top 10 boats were. Even though it was only 5 knots of breeze, everyone had good speed. So it really came down to picking the shifts right. In the 2nd race I played the right a little better and climbed through the fleet for a 6th. In the 3rd and final race of the day I was doing well as the 2nd boat clear ahead on the first beat, but I still didn’t play the right as well as some other boats and found myself deep again, especially after a couple sailors made the left work and came out of nowhere. So I’m in 10th a good few points out of 9th. They’ve moved up the start time to 9am in hopes of getting more racing in before the 1pm cutoff and before the remnants of Tropical Storm/Hurricane Karen come through late Sunday evening. Tomorrow’s another day and hopefully we’ll have something other than light air and flat water for me to work with and climb up in the standings. After sailing we hung out on the fabulous porch at the club watching football, sharing sailing war stories and singing along to guitar with the other campers.